Marinara is a delicious and simple sauce that has become trivialized because of it’s simplicity but that does not take away from it’s greatness. In the Americas, people believe Marinara as a simple ‘red’ tomato sauce and while mostly true, it’s also a very good foundation especially good for adding simple ingredients like shrimp or calamari. It’s wonderful with all kinds of seafood and fish, which is why we believe it has been tagged as a ‘Marinara’ or Mariner’s sauce. Legend has it that cooks aboard ships returning to Napoli from the Americas invented the Marinara sauce. What we do know is the deliciousness within it’s simplicity, pure joy. For our recipe we a use a hint of a typical Napolatane ingredient, the anchovy. A bit of pinot grigio and a dash of lemon juice help temper the fresh san marzano plum tomatoes. We can add braised shrimp and capers, or simply toss in some infornate black olives or just add a dollop of ricotta on top. 1. In a medium sized dutch oven heat 3 tbsp of olive and 3-4 chopped marinated anchovy fillets. Sauté the onions, garlic and optional hot pepper flakes. 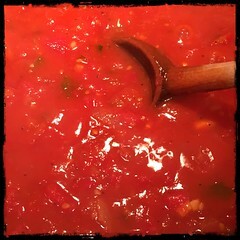 3. add the tomatoes, mix well and let come to a simmer. 4. As the tomatoes break down add the tomato paste. 5. After about 15-30 minutes you should begin tasting and adding salt and pepper. 6. Once the sauce is as you wish toss in some fresh basil followed by juice from 1/2 lemon. 7. Now’s the time to let the sauce simmer until it reaches perfection. Taste occasionally and add salt and/or pepper until the desired taste is achieved.